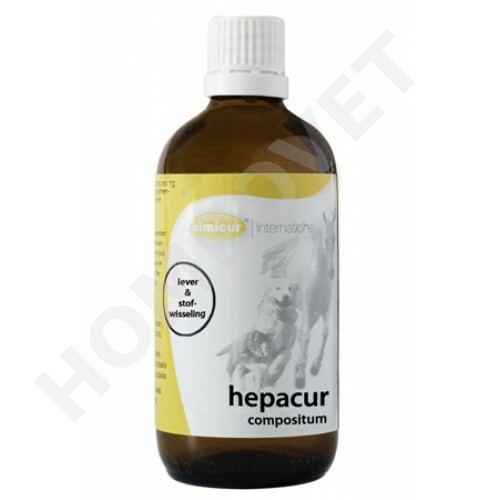 Hepacur is a homeopathic tincture in a 100 ml dropper bottle of SIMICUR for oral use in dogs, cats, horses and ponies. Application: Administered to the feed Hepacur ensures for optimal metabolism, resulting in a healthy and normal response to disorders of the liver. Therefore Hepacur can be applied to fatigue due to a defective function of the liver, liver inflammation accompanied by an increased amount of liver enzymes in the blood serum and in jaundice (yellowing of the whites of the eyes and mucous membranes) due to a toxic bile disorder. Effects: disturbances in the function of the liver and bile juices can occur as a result of overloading the digestive and general metabolism. Taraxacum acts secretion-promoting on the glands of the Mafen-intestinal canal, this effect is stimulated by Hydrastis, which also aids digestion. Nux vomica is a common means to combat indigestion.